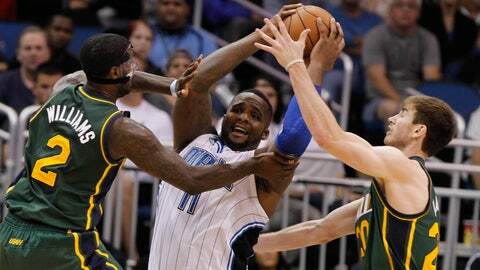 Orlando power forward Glen Davis is hounded by Utah's Marvin Williams (left) and Gordon Hayward (right). "You have to have guys step up," said Nelson, who missed an opportunity in the closing seconds to hit a shot which would have sent the game into overtime. "And I felt guys did that, at least in terms of playing through mistakes and sticking together. We’re down 22 points (a game) with him out. It’s tough." "Obviously we miss Arron," coach Jacque Vaughn said. "But I think we got some good looks and looks at the rim. You’ve got to give their defense credit. They contested shots at the rim also." "I wouldn’t say I was winded," he said. "But I was a little bit tired out there. I’m not going to lie." "At the end of the year, we didn’t have Jameer, we didn’t have Glen, and we didn’t have Arron," he said. "He hadn’t even played with Glen. And to miss basically this entire year thus far but a few games, he’s learning to play with teammates. He’s learning where he fits in with us and how the team fits around him as well. There’s a lot of room, a lot of time for us to grow together. And it’s going to take some time for him to get back in a comfortable rhythm and to understand his role with this team." "When he’s comfortable, he’s very effective, as you all could tell," Oladipo said. "After he hits the first few, he has a rhythm and that’s all she wrote from there. It’s just like in college. When he has a rhythm and it feels good, it’s going to go in." "I got the shot I wanted," Nelson said. "We executed well. I just missed the shot. I’ll take the same shot the next time and try to make it." "You can have as many shots as you want," he said. "But if you shoot the ball and it doesn’t go in, it just doesn’t go in. You’ve just got to keep shooting." Asked what advice he gave Oladipo afterward, Vaughn said: "Go get some liquids in you, get a good night’s sleep, come to work tomorrow. You’ve got Sacramento (on Saturday night) and a tough backcourt you’ve got to guard against. Life goes on, and here we go."